The choice of materials for acoustic treatment is paramount. We find out what different types of absorber can and can’t achieve. To achieve a great–sounding studio, absorbing foam and mineral wool is often used to reduce the coloration that the room would otherwise create. Both in control and live rooms, these porous absorbents can be used to reduce excessive reverberance and attenuate reflections that would otherwise change the timbre of the sound at mid and high frequencies. But how well do they perform? How should they be applied? And do household materials such as duvets offer an effective alternative, or is this an urban myth? 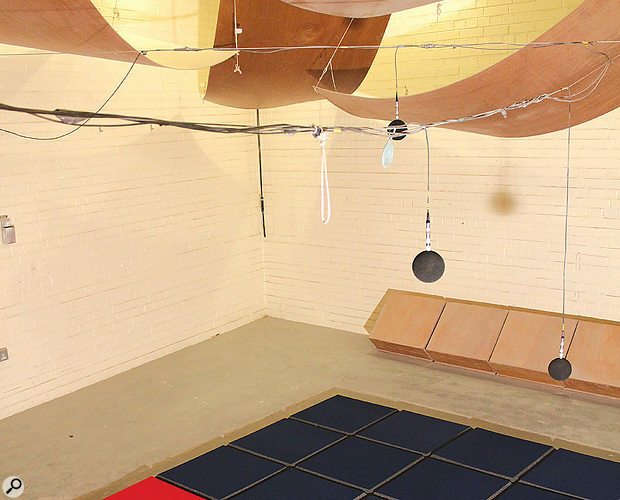 Sound On Sound gathered up nine samples and headed to the Acoustics Laboratories at the University of Salford to find out. Porous absorbents can be made from many different materials. Products designed for the purpose are often constructed from fabric–wrapped glass fibre or acoustic foams, but there are also soft furnishings that ‘accidentally’ create absorption such as curtains and carpets. Figure 1 shows how the absorption varies with frequency for all the products tested at Salford. The absorption is quantified in terms of the absorption coefficient following an International Standard (for more details see the ‘Caveat Emptor’ box). An absorption coefficient of 0 indicates that no sound is absorbed, while a coefficient of 1 means all sound energy is removed. 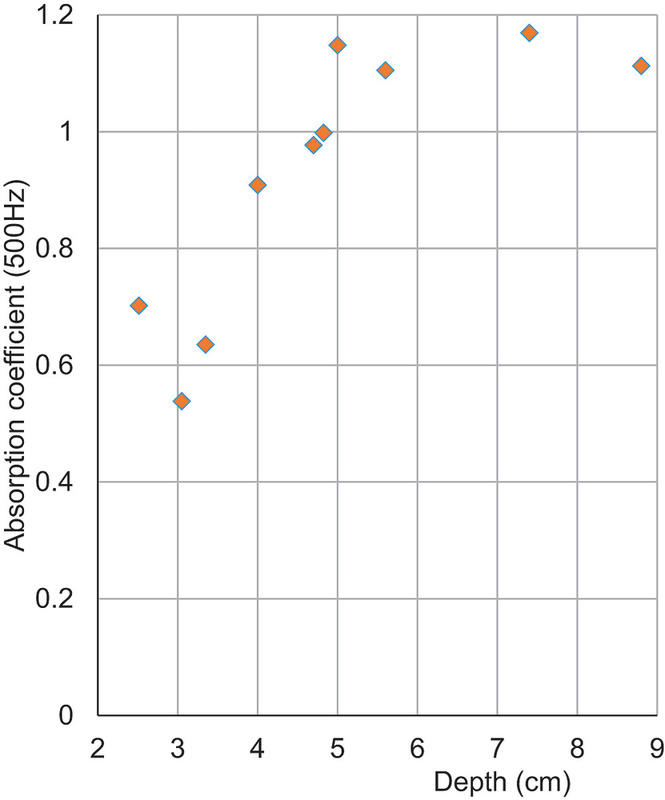 Figure 1: A graph of absorption coefficient against frequency for all products tested. The left–hand side of the graph measures absorption at a frequency of 100Hz — in musical terms, the note G2 towards the bottom of the cello’s range — and it’s clear that none of the products produce much absorption in this region. 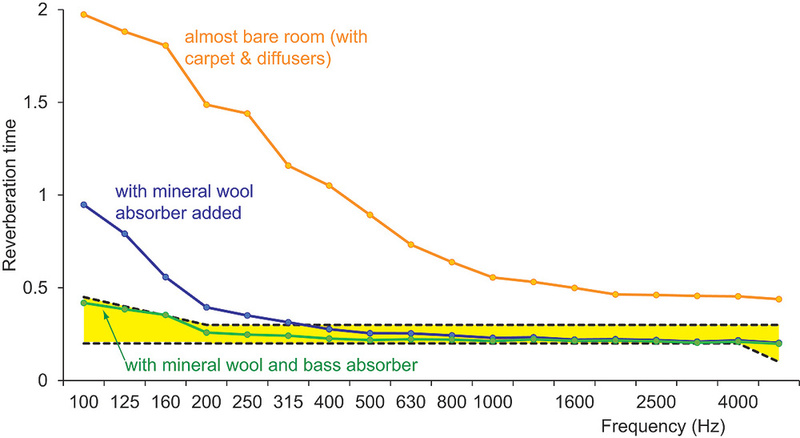 In general, porous absorbers are not good for treating bass effects such as the ringing of room–mode resonances. When a room acoustic needs controlling at low frequency, this is best done with resonant absorption using a device such as a membrane absorber (see our February 2015 guide to control–room design). 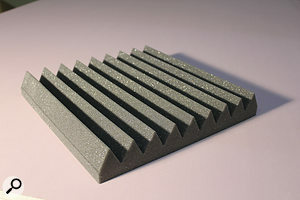 Although you can buy foam “bass absorbers”, the idea that placing these in the corners of the room is the most efficient and effective way of controlling the bass defies the physics. As Figure 1 shows, for porous absorption, the general trend is for the absorption to increase with frequency, before flattening out somewhere close to 1. 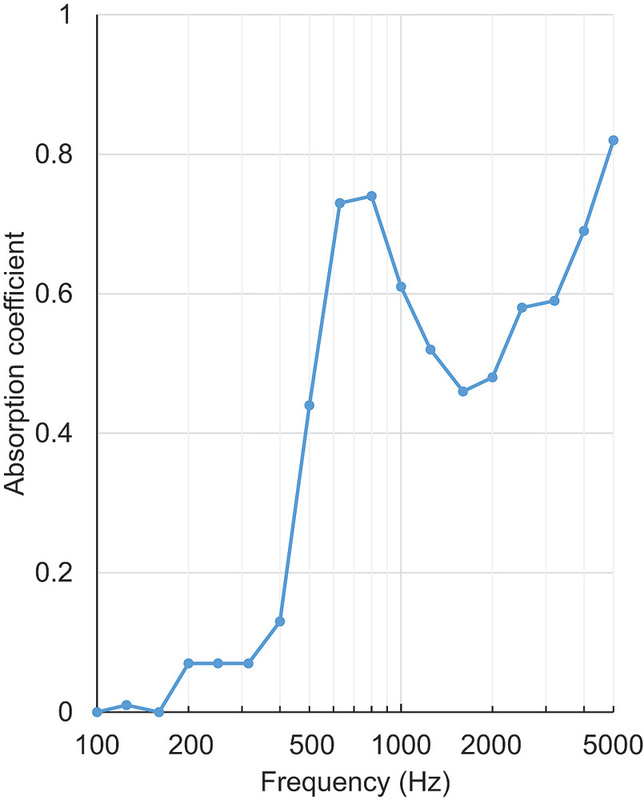 A curious feature of the measured absorption coefficients is that they can exceed 1. This is odd, because the absorption coefficient is defined as the ratio of absorbed to incident energy, which means a coefficient greater than 1 implies a treatment that somehow absorbs more sound energy than is incident upon it. This arises because of a well–known flaw in the measurement standard. Over the decades, acoustic engineers have gotten used to reading these charts with seemingly impossible numbers on them! What do these results say, then, about what makes a good porous absorbent? The shallower devices tend to be at the bottom of the graph, and the deeper ones at the top, so the shallower items absorb less. Take the absorption coefficient at 500Hz as an example. Figure 2 plots this mid–frequency absorption coefficient as a function of the average depth of the treatments tested, as measured with a ruler. More depth means more absorption until a depth of 5cm is reached, whereupon no improvement in performance is gained by making the treatment deeper. Figure 2: The absorption coefficient at 500Hz plotted against average depth for the products tested. The performance of many porous absorbers can be explained by comparing the size of the sound wave to the depth of the treatment. The size of the wave is quantified using the wavelength, which is the distance between adjacent crests of the wave. The wavelength varies greatly with frequency: at 50Hz the wavelength is 6.8m, at 500Hz it is 0.68m and at 5000Hz it is 0.068mm. A simple rule of thumb is that for a porous absorber to be effective it needs to at least a 10th of a wavelength thick. At 500Hz, this equates to a depth of 6.8cm, which roughly tallies with the 5cm found in Figure 2. 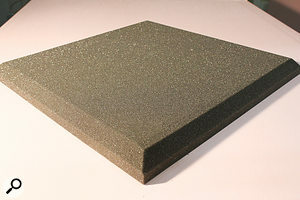 The very large wavelengths of low–frequency sounds are the reason why bare acoustic foam makes an inefficient bass absorber unless the material is extremely thick. For a 52Hz sound, for example, a layer of porous absorbent 65cm thick is needed to provide absorption — and this needs to cover a large surface area, not just a few pieces in the room corners. The products tested at the University of Salford had lots of different shapes: wedges, flat and wavy. By just looking at flat samples, the effect of the absorbent depth becomes clearer, as Figure 3 shows. Figure 3: The performance of a porous absorbent is strongly influenced by the thickness of the treatment (data from MJ Cocker, Handbook Of Acoustics, John Wiley & Sons, 1998). As the foam gets deeper, the biggest effect is to push the bandwidth of useful absorption to a lower frequency. 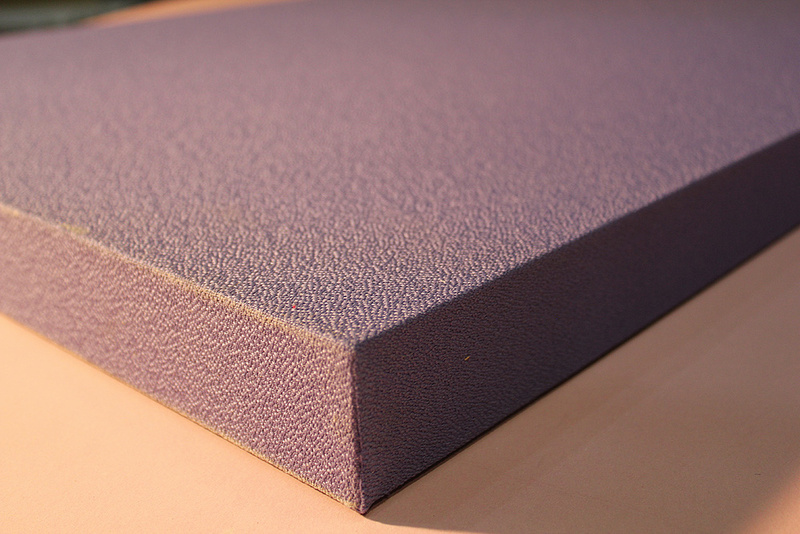 The 13mm foam is effective from about 2000Hz up; double the depth to 25mm and an extra octave of high absorption is obtained, with good performance now from 1000Hz and above. 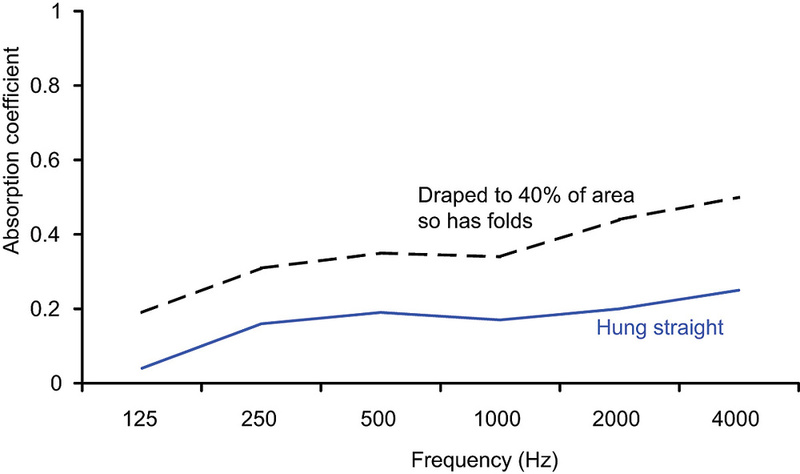 The absorption curves in Figure 1 split into two types: (1) a rough straight line rising steadily across the whole frequency range measured, and (2) a response that first rises and then flattens out at and above 500Hz. The latter shape, the one that looks a bit like the response of a high–pass filter, is the most useful for room acoustic treatment. One use of absorption is to reduce reverberation. In most rooms there will normally be some absorption at high frequencies due to carpets and curtains, and where additional treatment is most needed is at low and middle frequencies. Consequently, the best response for a porous absorbent is similar to a high–pass filter, with the challenge being to get the useful range starting at as low a frequency as possible. Another use for porous absorbent is to attenuate specific reflections from the walls, ceiling and floor of a room. What is needed here is the broadest possible frequency range to remove all parts of the reflection. Thinner materials might have a use in treating specific high–frequency defects such as flutter echoes, but otherwise a deeper absorber is better. However, all is not lost for the thinner products, because their performance can be greatly improved by giving them some air. When a piece of acoustic foam or fibreglass is placed onto a wall, most of the absorption is done by the part of the material that is furthest from the wall (see the ‘How They Work’ box). Consequently, getting better performance does not necessarily require making the material thicker: mounting it away from a wall can be equally effective. 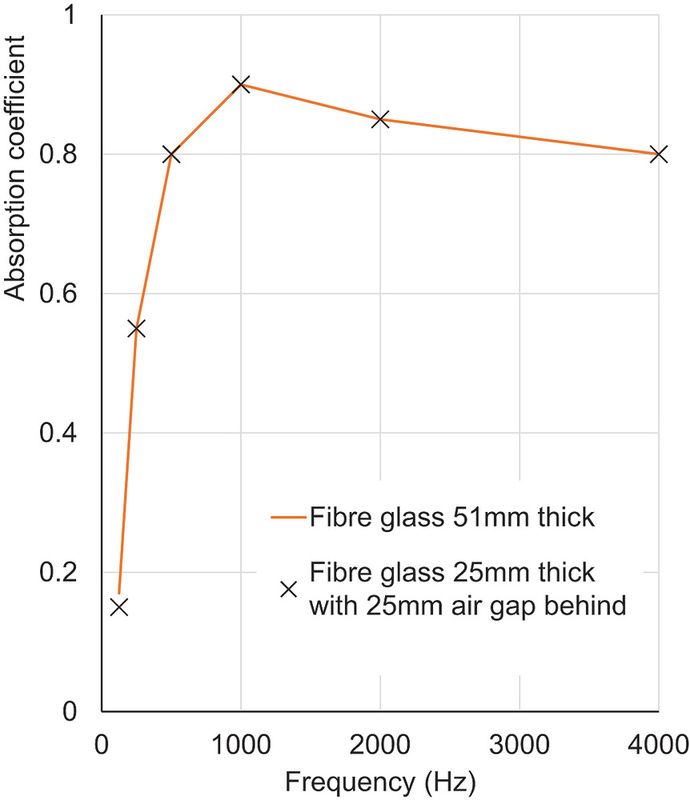 Figure 4: The same absorption can be achieved by hanging a thinner piece of absorbent away from the wall, creating an air gap behind (data from CM Harris (ed. ), Handbook Of Noise Control, 2nd ed. McGraw–Hill, 1991). 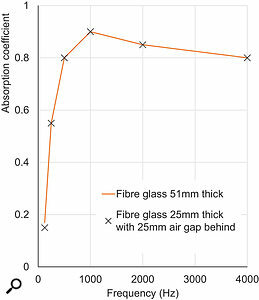 Figure 4 shows the absorption coefficient for two fibreglass samples. The absorption provided by the 51mm sample is identical to that provided by a sample half the thickness, but set 25mm from the wall. The only problem with this solution is that it isn’t always easy to mount the absorbents away from the wall. Sometimes it is easier just to buy thicker material for ease of attachment. The only product in our tests that explicitly exploits the idea of getting the absorbent away from the wall was the Profoam. This has a wavy pattern that naturally places an air gap behind some of the material. This makes it perform slightly better than the wedges that had a similar depth, but still there is not enough of the absorbent far enough from the wall to create sufficient mid–frequency absorption. This need to get porous absorption away from walls also influences how curtains should be hung if they are to be used for acoustic treatment. Figure 5 shows the absorption coefficients for two different hangings of a curtain. As the curtain is hung with deeper folds, more of the material is further from the wall, and hence more absorption is gained. 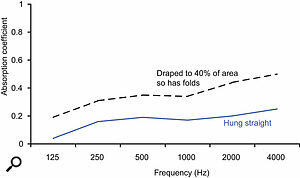 Figure 5: By hanging curtains with big folds to move the material away from the wall, the absorption can be greatly increased (after TJ Cox and P D’Antonio, Acoustic Absorbers & Diffusers, CRC Press, 2009). Animal, Vegetable Or Mineral Wool? 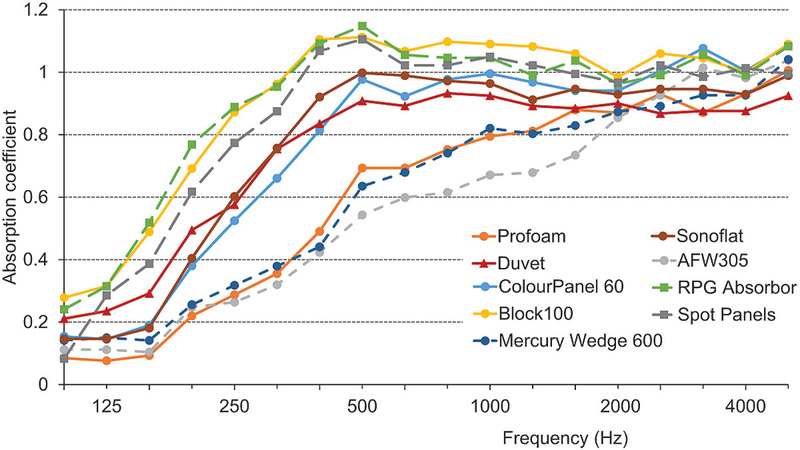 Figure 1 shows that of the materials we tested, the two mineral–wool samples perform similarly, and are comparable with Block100, the most effective of the acoustic foam samples. 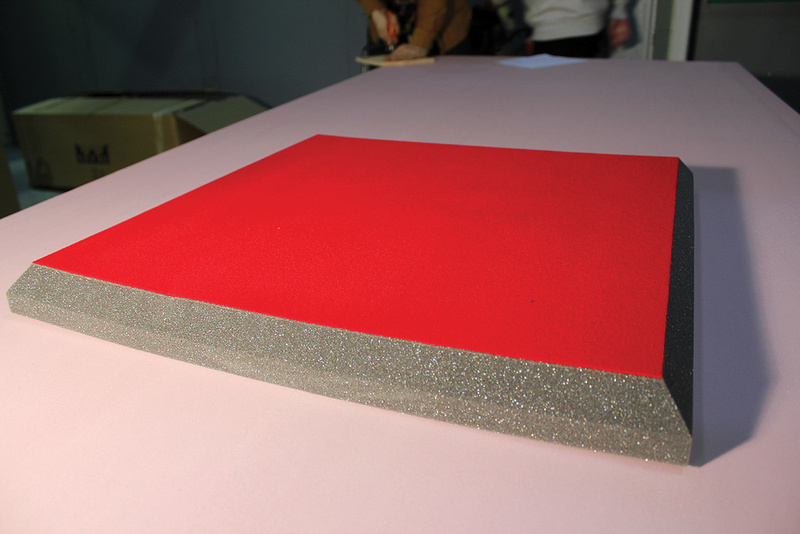 The Block100 foam is, however, almost twice the thickness of the two mineral-wool samples. This illustrates that a variety of materials can be used to make effective porous absorbents. This is to be expected, because what counts is the size, shape and tortuous connectivity between the air pores and not the material of the matrix. I have heard at least one person suggest that melamine foam is intrinsically better than polyurethane. In terms of acoustic performance, the only melamine foam tested was the Profoam, and this did not show additional absorption compared with the polyurethane samples. If they are designed properly, all these materials can absorb sound. One difference between the fibreglass and foam samples that is lost in the standard measurement result is the effect of the edges of the samples. The two mineral-wool treatments had hard frames at the edges, one made from wood and the other from plastic, whereas the foam samples had the absorbent exposed at the edges. This means that if the foam samples are used in a studio with their edges exposed, you will get a little more absorption than is shown in Figure 1. It depends on the thickness of the samples, but for the 10–12–square–metre samples we tested, leaving the edges exposed can increase the absorption by between 3 and 10 percent. For this reason, spacing foam tiles out with gaps between can increase absorption. But if the gaps are too large, there is a risk of getting a strong reflection from the exposed wall. Another difference between materials is that the mineral wool needs covering to protect it from damage. If this is done with a thin cloth that readily allows sound waves to enter into the absorbent, then there is little difference in performance, as Figure 6 shows. 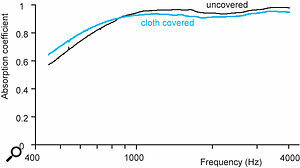 Figure 6: Adding a cloth covering to mineral–wool absorbent boosts low–frequency absorption but reduces high–frequency performance (after TJ Cox and P D’Antonio, Acoustic Absorbers & Diffusers, CRC Press, 2009). 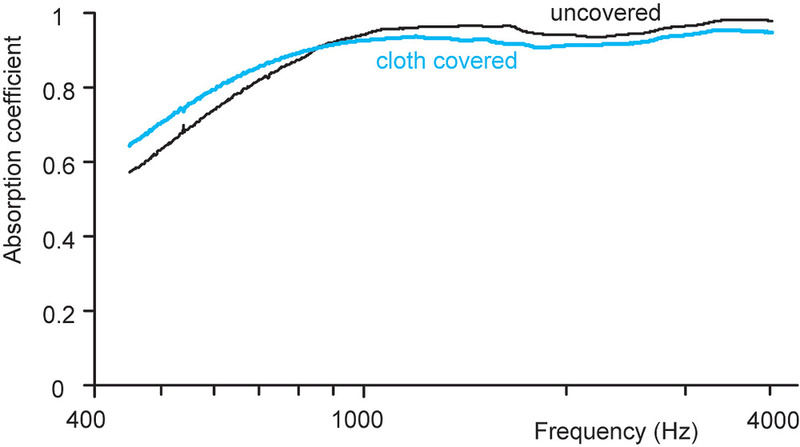 A cloth covering tends to provide a small boost in lower–frequency absorption, but at the cost of high–frequency performance. For many applications, this is a good trade–off to make, because it is mid–frequency absorption that is hard to achieve. Foam does not need covering, but it is important that it passes appropriate fire safety standards. Acoustic foam comes in lots of different-shaped patterns. Some companies seem to favour foam that echoes the shape of egg cartons, others copy the shape of acoustic diffusers, and two of the samples tested at Salford were made from wedges. The results in Figure 1 show that forming the foam into wedges degrades the acoustic performance. What is needed is to get as much of the porous absorbent as far away from the wall as possible. For that reason, I suspect the wedge samples would perform better mounted with the flat side facing the room, although it would be difficult to attach the wedges to the wall! 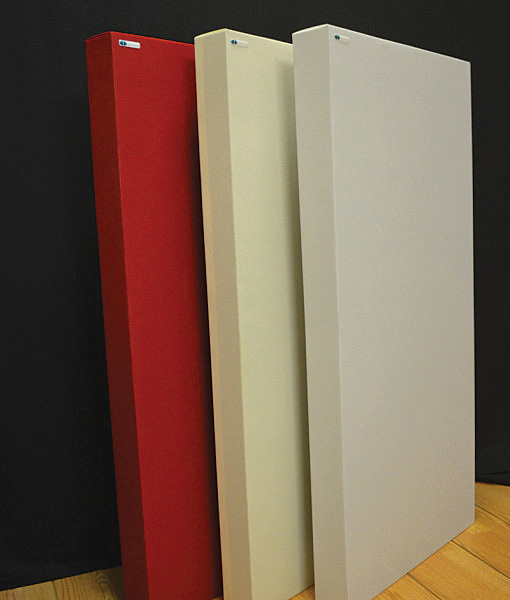 Auralex make a large number of different–shaped treatments from the same acoustic foam. 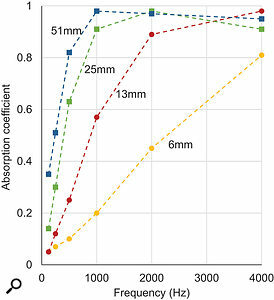 Examining their table of published absorption coefficients for 50mm–deep samples, one thing that leaps out is that all the profiled shapes perform worse than the simple 50mm flat tile. Is it possible to use soft furnishings to treat a room and save money on expensive acoustic treatments? As Figure 5 shows, it is possible to gain some absorption from curtains, but the acoustic treatments we tested performed better. To get more comparable absorption from curtains, the drapes need to be thick and heavy. Special acoustic curtains might be made from wool serge or velvet velour and weigh about 0.5kg per square metre. A pair of thin drapes from your local home furnishing shop is not going to be sufficient. One advantage that curtains have over the treatments Salford tested, however, is that they can be drawn back to vary the acoustic, a feature useful in live rooms. While hard flooring has become very popular over the last few decades, using carpet in a studio will gain useful absorption and reduce noise from people walking about and moving chairs. Being a porous absorbent, carpet produces mid– and high–frequency absorption. To maximise the absorption, the carpet should have an open back with an open–cell underlay. The absorption is very dependent on the type of carpet and how it is made. 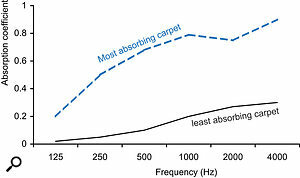 Figure 7 Figure 7: The absorption of carpets varies greatly. The graph shows the least and most absorbing carpets from tables in acoustic engineering textbooks (after TJ Cox and P D’Antonio, Acoustic Absorbers & Diffusers, CRC Press, 2009). gives the performance of the best and worst carpets from data in various textbooks. 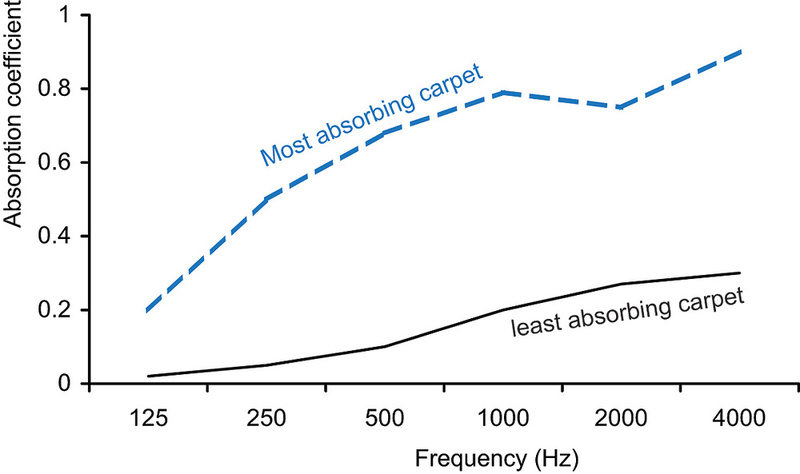 Focusing on one frequency, for example 1000Hz, the absorption coefficient can vary between 0.1 and 0.8 for different carpets. Data from books cannot be relied upon when picking a carpet: measurement data for the particular product you want to buy is needed. A better home–made solution is to use old duvets. The ones we tested were borrowed from colleagues at Salford University and had a mixture of tog values. As Figure 1 shows, the old duvets tested had similar performance to the two flat acoustic foam samples of similar thickness. The foams did better from 500Hz and upwards, but then are considerably more expensive. How would an acoustic engineer use the results from the product test to choose the right absorber? Take the example of treating a smallish control room that is 4m wide by 4.5m long and 2.5m high. The amount of absorption has to be chosen so the room is not too ‘dead’ or too ‘live’: to put it in more scientific terms, it has to have the right reverberation time. The reverberation time measures how long it takes sound to decay by 60dB. A well–treated control room would typically be expected to have a reverberation time between about 0.2 and 0.3 seconds across the frequency bandwidth that porous absorbers are effective. Figure 9 shows a calculation of the reverberation time in the example control room with different amounts of treatment. The target range for the reverberation time is shaded in yellow. Figure 9: Adding treatment to a room to get within the desired reverberation time range (shaded in yellow). It has been assumed that a carpet is being used. If a floor covering has to be bought, purchasing a carpet and underlay that provides some absorption will save money on other absorbents. The only way to be sure that the carpet you buy is going to be effective is to find a manufacturer who publishes absorption coefficients. 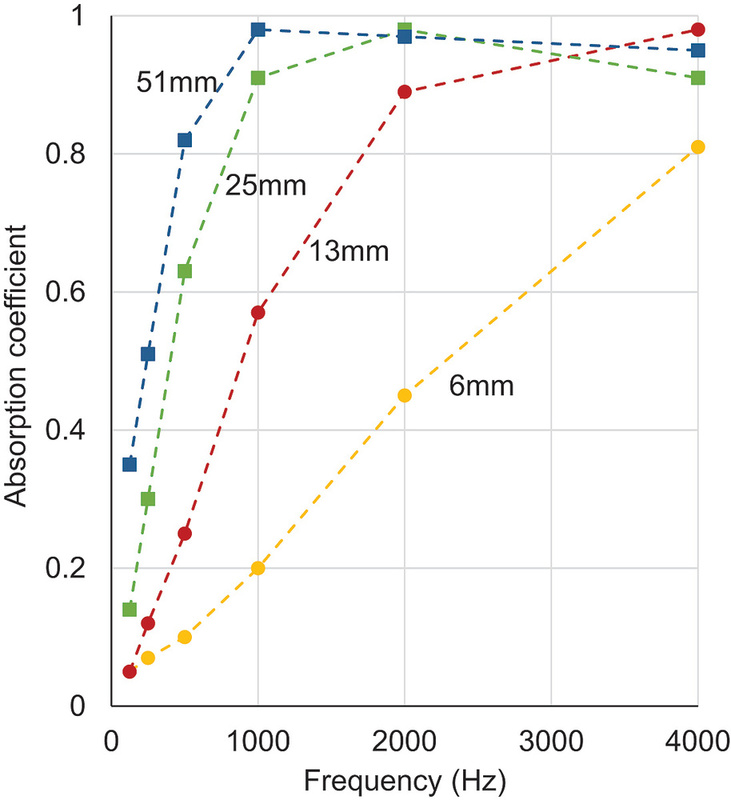 The small amount of absorption from 10 square metres of diffusers in the room is also included in the calculation, using the absorption coefficients published by a manufacturer. When the room just contains the carpet and diffusers, the reverberation is a long way above the target range, as the orange line in the graph shows. Which porous absorber treatment should be used to fix this? The room is only a little above the target frequency range at the highest frequency, so sticking any of the three thinnest treatments in our tests to the wall — Profoam, AFW305 and Mercury Wedge 600 — would not be the best choice. If enough of these treatments were added to the room to reach the target value at a mid–frequency like 500Hz, then the reverberation time would be below target at higher frequencies, and the room would probably sound too dry in the treble. There are solutions to this, such as spacing the thinner foam from the wall, but a simpler approach is to choose a sample that creates a flatter frequency response above 500Hz and can be attached straight to the wall. Any of the other samples tested could be used, and at this point it might be worth considering the cost, appearance and robustness of the various treatments. If the other products in the manufacturers’ catalogues were also considered, then there is a bewildering choice of colours, finishes and shapes. I would always be guided by the absorption coefficients, but the testing revealed some simple rules of thumb. Choosing a deeper product increases the bandwidth of absorption to a lower frequency, and although shaping a porous absorbent may improve the appearance, if that alteration removes foam from the part of the absorber furthest from the wall, it risks decreasing the performance. Let’s suppose the mineral–wool treatment with the greatest absorption per square metre is used to take our hypothetical control–room design further. Adding 18 square metres of this absorber brings the reverberation time within the target criteria for 400Hz and above. That means 30 percent of the walls and ceiling surfaces would be covered with the mineral-wool absorbent. This would normally be distributed on the walls and ceiling where the sound first reflects when going from a loudspeaker to the sweet spot (once again, see February’s guide to control–room design). This is because the porous absorption has to both control the reverberation and reduce the coloration caused by early arriving reflections. None of the treatments tested can get the reverberation time within the design limits below 400Hz. For that, an absorber for lower frequencies is needed. Many companies sell blocks of foam to ‘treat’ low frequencies, but a better partner to the mineral-wool absorber is a membrane design that can create bass absorption without large amounts of high–frequency attenuation. You could draw an analogy with a two–way loudspeaker: the resonant absorber is the ‘woofer’ treating the low frequencies and the porous absorber is the ‘tweeter’ treating high frequencies. As an example, 11 square metres of a commercial product was added to the design to reach the final curve shown in green. Trevor Cox is Professor of Acoustic Engineering at the University of Salford, UK and author of Sonic Wonderland (ISBN 9781847922106). A number of manufacturers and distributors kindly loaned us samples from their product ranges for testing. 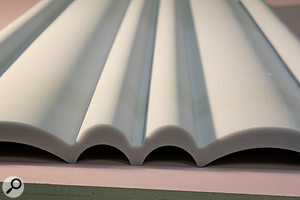 It should be pointed out that in most cases these companies offer a range of products, so for instance you would often have the option of buying a thicker panel than the one tested, if necessary. Prices vary considerably according to the material, thickness and construction: the cheapest product tested retails in the UK at £18 per square metre, while the most costly are over £60. The melamine foam forms a wavy shape that ingeniously moves some of the absorbent away from the wall to create additional absorption. However, even with that, the absorption is too low at mid–frequencies, and so spacing further from the wall or using multiple layers stacked on top of each other is needed. The absorption graph on the manufacturer’s web site did not match our measurements because the product tested at Salford University was made from a different type of foam. A 50mm–thick acoustic foam absorbent with bevelled edges and a smart nylon fabric on the front to improve the appearance. It took quite a search to find the absorption coefficients on the company’s web site, but once found it was reassuring to see a close match with the results we got. The Auralex Sonoflat 22 performed a little better from 250 to 400 Hz. 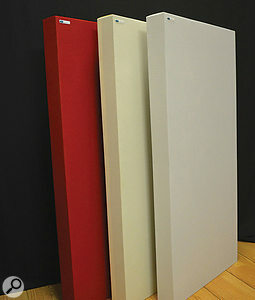 A polyurethane acoustic foam made in the UK by Comfortex Acoustics in Oldham. The absorption coefficients were easy to find on the product’s web page and matched the measurements made at the University of Salford. The sample is not very deep, and the addition of wedges means not much of the absorbent is furthest from the wall. To get good performance you’d need to space this sample from the wall, or buy one of the company’s deeper products instead (see below). The thickest sample measured, almost twice as thick as any other, and this is one reason it is amongst the best three products tested. A polyurethane foam with acoustic absorption coefficient data easy to find online. 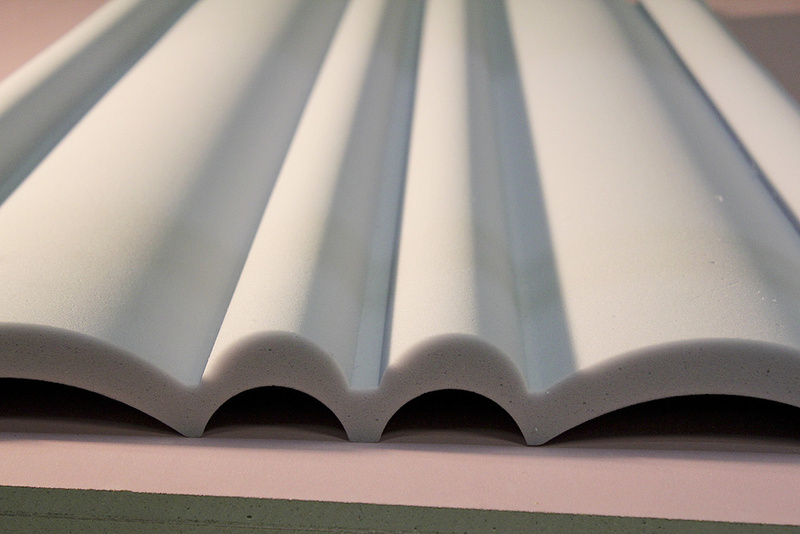 The profile shape breaks up the panel so a treated wall does not become a block of grey foam. This is made from mineral wool that is edged with plastic and fabric-wrapped in a range of finishes. The acoustic data for this 50mm sample was easy to find online and matched Salford’s measurements. 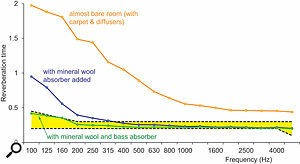 It was slightly better than the other mineral-wool absorbers tested between 160 to 315 Hz. A polyester foam with better performance from 500 to 1600 Hz than the similarly shaped AFW305. For most situations, however, it will need spacing from the wall to give good performance. Unfortunately, the web site just gives a single NRC value as a measure of performance rather than the full absorption coefficient. Makes a feature of being melamine–free. The foam can be purchased in many different shapes, but Auralex’s own data shows that the simple flat design has the best acoustic performance for a 50mm depth. The Spot Panel is constructed with a solid wood frame and fibrous material in the middle and is fabric–wrapped. They were among the best absorbers tested, although the RPG Absorbor had a slight edge for 160 to 315 Hz. When buying an acoustic absorber, you should expect the seller to provide data for the absorption coefficient measured using the international standard ISO 354:2003 (or the US equivalent ASTM C423). Measurements are done in a large reverberation chamber — the one at University of Salford is 220 square metres and has a lively acoustic like a large church. When absorbing material is brought into this room, it deadens the sound. The measurement standard uses this change in the room acoustic to quantify the absorbent via the reverberation time. Extremely loud noise is blasted into the room, and then suddenly switched off. The reverberation time is then the time it takes sound to decay by 60dB. The reverberation time is measured with the room empty, and then with 10–12 square metres of absorbent present. The absorption coefficient is calculated from the change in the reverberation time. The most reliable data comes from an independent accredited laboratory like the University of Salford. Even if you don’t fully understand what is being measured, seeing a test certificate at least gives some assurance that the firm selling the acoustic absorption is not just making up the numbers. Salford University has been testing sound absorption since 1965, and for many years has had UKAS (United Kingdom Accreditation Service) accreditation for ISO 354 tests. This means that UKAS carry out regular inspections to ensure the acoustic laboratories have the correct quality–assurance procedures in place to ensure accurate measurement. One of the problems with ISO 354 is the variation in results between different laboratories. Absorption coefficient values for the same sample can vary by up to 0.2 between laboratories. What makes this Sound On Sound test unusual is that the different samples have all been measured in the same reverberation chamber, making the results directly comparable. 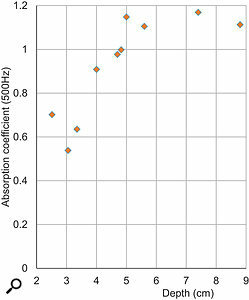 Absorption coefficients greater than 1 are not unusual for porous absorbents. This happens because placing a large area of absorbent in the reverberation chamber changes how sound propagates around the room. While the method has been around for over five decades, no one has yet come up with a solution to this problem that is satisfactory to everyone. I would only buy acoustic treatments from firms that provide absorption coefficient data. One site I looked at has a graph of “Relative Absorbance”, whatever that might be, and just looking at the graph it is clear these are not measurements from a reverberation chamber. Another thing I am wary of is companies just giving single-figure values such as the NRC (Noise Reduction Coefficient). This is an average over the frequency ranges 250 to 2000 Hz. 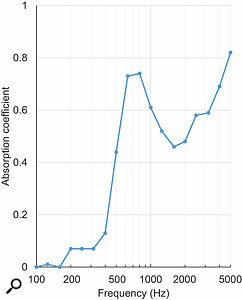 What you need to know for a porous absorbent is the frequency on the graph at which the absorption flattens out. A final word of warning: many sites boast testing of their products to an international standard, but many times the standard quoted is the one for fire resistance and not for acoustic performance. Look out for ISO 354:2003 or ASTM C423, as these are the acoustic standards. Porous absorbers generally remove sound energy in a similar way. Most of the absorption comes from the way the sound waves squeeze through the labyrinth of tiny interconnected pores within the material. 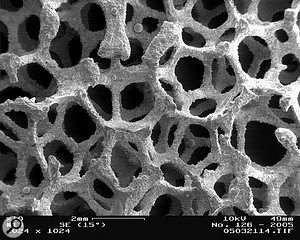 As the sound moves through the pores, it causes air molecules to drag along the interior surfaces of the material. Air is a viscous fluid — a bit like treacle, only a lot less viscous! It takes effort to drag the air molecules across the interior surfaces, and this turns the vibrations of the air molecules that make up the sound wave into heat that is then dissipated in the material. The vibration of the material itself usually makes very little contribution to the absorption. 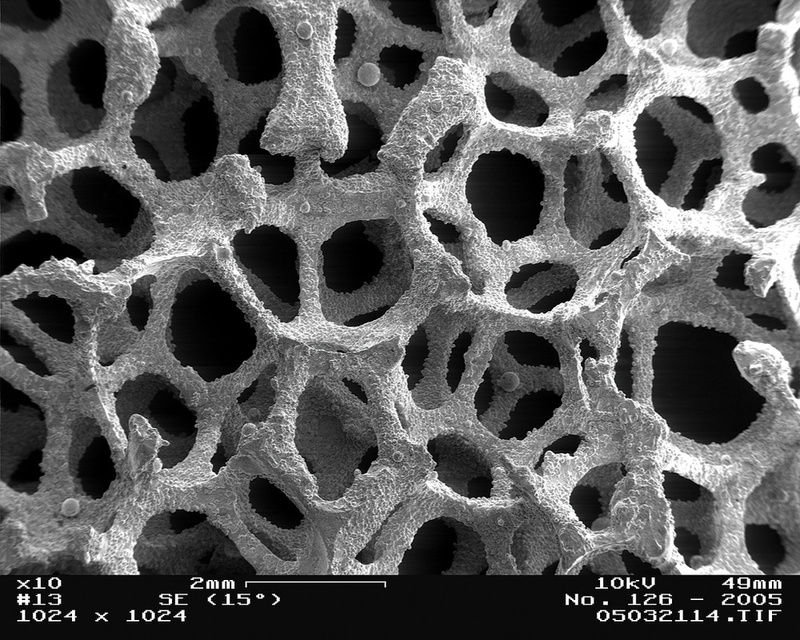 The electron microscope (right) shows the pores for an open–cell foam. Good absorbents are about 95 percent air, giving a large internal surface area to gain high absorption. The pores also need to be less than a millimetre in diameter to get enough absorption. Normal foams that you might have in your sofa at home are closed–cell (think of layers of bubble–wrap): the air pockets are not connected together and consequently they are relatively poor acoustic absorbents. Not all mineral wools are good acoustic absorbents, and density alone is not enough information to be sure of their performance. A mineral wool such as glass fibre is made from woolly filaments that are glued together. Too much binder or the wrong sized filaments and the absorption can be compromised. Mineral wools should only be bought if test data for the absorption coefficient is known (see the ‘Caveat Emptor’ box). There have been some concerns about the long–term health effects of mineral-wool fibres, but the current evidence is that they are just irritants to the skin and not carcinogenic. 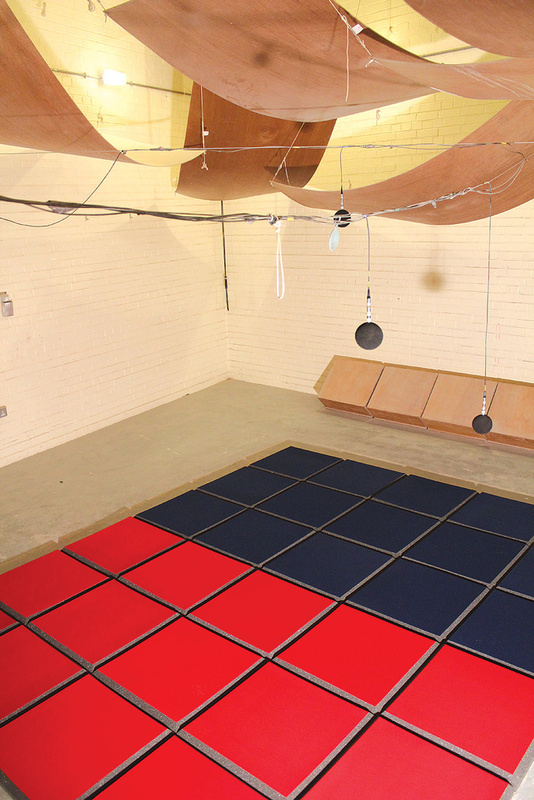 Porous absorbers for music studios are used to treat mid– and high–frequency room-acoustic problems. They are typically made from acoustic foam or mineral wool; either material can be effective, but for a given depth, mineral wool performs a little better. Treatments need to be at least 5cm thick, with thinner treatments needing spacing from the wall. 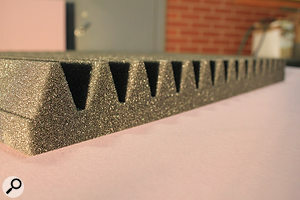 Shaped foam might look more attractive, but cutting away material generally reduces performance. Only buy products where absorption coefficients measured using the standard ISO 354:2003 or ASTM C423 are given; the gold standard is performance data measured and certified by an independent laboratory. 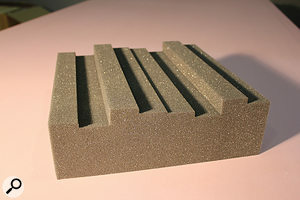 Foam and mineral wool on their own are ineffective for soundproofing, ie. stopping sound getting into or escaping from studios.